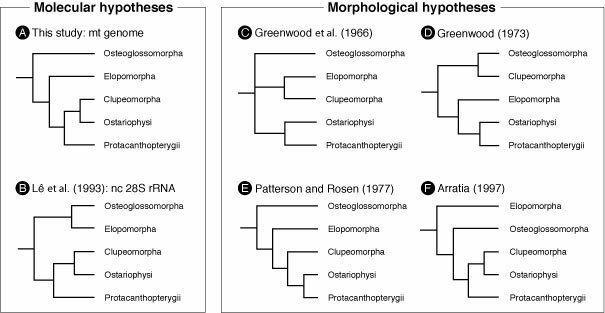 We reexamined the interrelationships of the five major, basal teleostean lineages (Osteoglossomorpha, Elopomorpha, Clupeomorpha, Ostariophysi, and Protacanthopterygii; given various rankings) using mitogenomic data for which five alternative phylogenetic hypotheses have been previously proposed on the basis of both morphological and molecular analyses. The resultant tree topologies from the MP and ML methods were congruent, although they differed from any of the previously proposed hypotheses. Furthermore, the mitogenomic data confidently rejected all of these hypotheses with high statistical significance. Inoue, J. G., Miya, M., Tsukamoto, K., Nishida, M. 2001. A mitogenomic perspective on the basal teleostean phylogeny: resolving higher-level relationships with longer DNA sequences. Molecular Phylogenetics and Evolution 20, 275-285. Inoue, J. G., Miya, M. 2001. 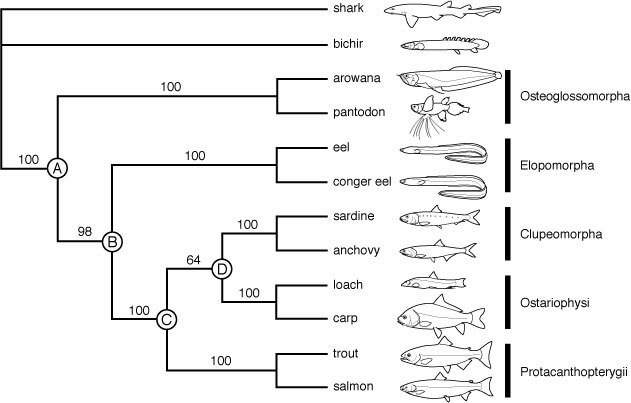 Phylogeny of the basal teleosts, with special reference to the Elopomorpha. Japanese Journal of Ichthyology 48, 75-91 (in Japanese with English abstract).